When no one is looking, a gangly orangutan named Fu Manchu reaches into his mouth and pulls out a wire. Carefully, Fu, housed at the Henry Doorly Zoo in Nebraska, begins to pick the lock to his enclosure’s door, and escapes! He and his orangutan cohort have the run of the zoo, until his keeper Jerry brings them all back home. 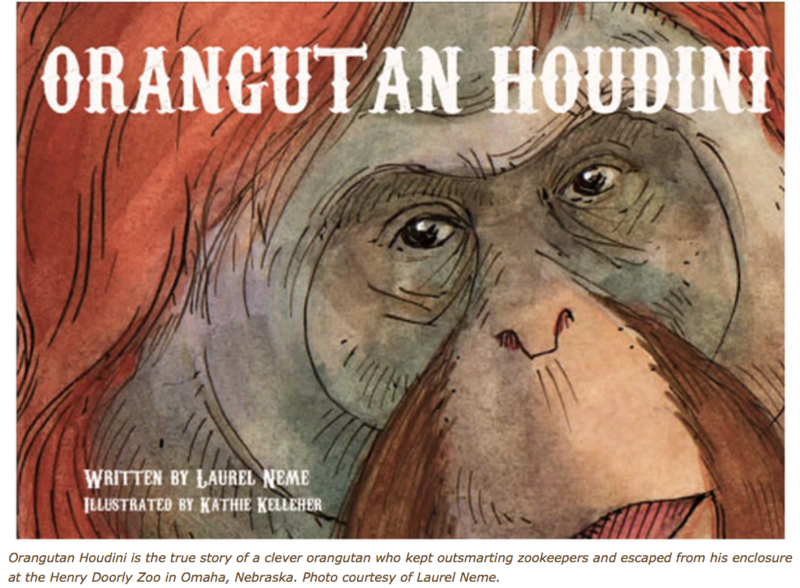 This colorful true story of Fu Manchu’s cleverness is the subject of Laurel Neme’s first book for children, Orangutan Houdini, illustrated by Kathie Kelleher. In her picture book, Neme and Kelleher use words and pictures to show young readers this great ape’s intelligence and love of fun. Full of charm, Orangutan Houdini is a perfect gift for any budding naturalist. Neme first heard about this amazing ape while researching orangutans for another one of her books. She was inspired to write for children after requests she received for a child-friendly version of her adult book Animal Investigators, a non-fiction book on wildlife conservation forensics (you can read an interview for the book here on mongabay.com). Kelleher’s illustrations bring Orangutan Houdini to life. After studying orangutan biology and movements, Kelleher produced witty images on each page that give personality to each character, human and otherwise. The pictures are both realistic and engaging. The late Fu Manchu became so famous that he was awarded an honorary membership to the American Association of Locksmiths, including a certificate which the Henry Doorly Zoo displayed outside his enclosure. Just as he captured the hearts of his zookeeper, Jerry, he’s sure the capture the hearts of the readers, no matter the age. You can read all of Neme’s articles for mongabay.com here, or visit her website here. Find out more about the book Orangutan Houndini here. Mongabay: Can you give our readers a little background on yourself and your work? Laurel Neme: I’m the author of Orangutan Houdini, a picture book based on the true story of an incredible ape, and of Animal Investigators: How the World’s First Wildlife Forensics Lab is Solving Crimes and Saving Endangered Species, a “CSI for wildlife” with a foreword by Richard Leakey and endorsed by Jane Goodall. Throughout my career I’ve worked in dozens of countries around the world for several organizations, including the U.S. Treasury Department, the U.S. Agency for International Development and several non-governmental organizations, such as the World Wildlife Fund. I also developed, hosted, and produced “The WildLife,” a radio show that explores the mysteries of the animal world through interviews with scientists and other wildlife investigators. Several years ago I turned to writing full time and today use my first hand insights to inform and build excitement about animals. I write regularly for National Geographic, and also contribute to mongabay.com. Closer to home, I volunteer with my son at Outreach for Earth Stewardship, where we help injured birds of prey. To me, sharing stories is both fun and fundamental for understanding and connecting with wildlife. Mongabay: What made you decide on this story in particular? How did you first hear it, and how did you research it for the story? Laurel Neme: In researching my first book, Animal Investigators, I was disheartened by the prevalence of apes in the illegal pet trade. I wrote several articles about orangutans, including some published on mongabay.com that addressed orangutan biology, how orphans learn to be wild, and threats to the species. The more I learned about orangutans, the more I became enchanted by their intelligence. I’ve even been fortunate enough to meet some very special, and devious, individuals myself. Fu Manchu is probably the most famous orangutan escape artist, but there are several others who easily could have been the subject of this story. Mongabay: You have written successful books for adults about serious topics like animal trafficking. What prompted you to change to writing children’s books? Laurel Neme: While I still write for adults, kids need good animal-related books too. That hit home after I did a number of events related to my first book, Animal Investigators—when parents and kids asked if I had a youth version. While I know that kids (10+) do enjoy that book, it made me realize how much kids are craving fact-based animal books. At the same time, I realized that my own interests in both animals and forensics were influenced by kids books like Doctor Doolittle and Encyclopedia Brown. That also prompted me to write stories that would inspire children to love wildlife. With Orangutan Houdini, my hope is that children come away with both a smile and a love of orangutans. Orangutans are endangered and there is a lot we can do to help them. But the first step is to care, and meeting Fu will help readers want to help them. Writing stories is about impacting hearts and minds. Two weeks ago I did several school visits for Orangutan Houdini. Afterwards, one mom wrote me to say “thank you for stirring up the hearts and minds of my young children.” A teacher also emailed, telling me that after my visit her students wore orange to raise awareness about the plight of orangutans. I still can’t stop smiling! Mongabay: How can children and their parents help endangered species like orangutans? Laurel Neme: There are many things kids and their parents can do to help protect orangutans and other endangered species. Most important is to create awareness. The example I mentioned of kids wearing orange is a great idea. Simple yet effective. Kids can also share information with their friends and classmates through school projects. That’s how it started for Madison Vorva and Rhiannon Tomtishen, two girl scouts who garnered national media attention for trying to get Girl Scout cookies to change the source of its palm oil, because it hurt orangutan habitat. Kids can write letters to their local newspapers, or share articles on social media. You can also get creative. One girl, Allie Boyer from California, raised awareness when she was nine-years-old by creating “Borneo Bob”, a flat cutout of an orangutan that “traveled” from child to child (with a letter explaining the plight of orangutans), similar to Flat Stanley. Another key way people can help orangutans is to write to companies that produce the products they use, and ask if the palm oil in them is from deforestation-free sources. That simple act tells companies that their customers care, and it really makes a difference! Of course, you can also support organizations that help animals. There are so many good ones, like Orangutan Outreach and Orangutan Land Trust (for orangutans), David Sheldrick Wildlife Trust (for elephants), Animals Asia (for bears) and many, many more. The important thing to remember is that it doesn’t have to be about orangutans. Kids can have an impact on whatever might be their passion. Mongabay: Can Orangutan Houdini be used in the classroom? Laurel Neme: Yes! I have a wonderful Teacher’s Guide that was developed in collaboration with educators and scientists. Several orangutan conservationists are even using it for their own education initiatives. You can download it free from my website (http://www.laurelneme.com/index.php/for-teachers). It’s geared towards kindergarten through fifth grade and has many age-appropriate activities for English language arts, mathematics, science, and social studies curricula. One of the best things is that it uses games, art, and drama as teaching tools throughout, and there are a number of ideas to help students take action to help orangutans or any other species. Mongabay: How was the process of working with an illustrator for the first time? Laurel Neme: It was a delight to see the story of Orangutan Houdini come alive with the illustrations. I very much enjoyed working with the illustrator, Kathie Kelleher. It’s interesting to see how someone else visualizes a story, and she did a wonderful job depicting the orangutans. The process was fun, too. Kathie would share sketches and we’d talk about them. She worked hard studying orangutan biology and movements. That helped make her drawings as accurate as possible. The best part was when I saw the finished drawings for the first time. What a thrill! To me they bring the story to life in a way that I hope enchants both kids and parents alike.